After the 9th-century Danish invasions and 10th-century reform of monasteries, the kind of decoration seen in earlier manuscripts such as the Lindisfarne Gospels becomes rare. Later Anglo-Saxon manuscripts have more solid-looking ornament and figures which are distinctive but inspired by art from the Continent. Although it is missing several of its original pages of decoration, the Bury Gospels exemplifies late Anglo-Saxon book art in a deluxe form. Inscriptions on a few of its pages indicate that in the 11th century it was at Bury St Edmunds, a monastery founded to keep the relics of Edmund, the martyred King of East Anglia. Despite its name, the style of the Bury Gospels' decoration suggests it was made at Christ Church, Canterbury. Royal interest in Edmund's relics--which gave Bury a high status--could have brought it this lavish gospels. 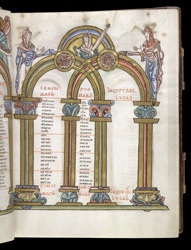 This page has a canon table, one of a series in a kind of index which, using a system of numbered sections, lists the similar passages of the gospels. Reading across the columns, one could locate all the passages which tell of, for example, the birth of Christ. In the Bury Gospels, the canon tables are set within opulent frameworks based on architectural designs. Three female saints top this frame, the one in the centre was probably meant to be the Virgin (although she holds the palm of martyrdom) because Christ is shown on the opposite table. The lively drawing with black lines and the shading and highlights of the richly coloured clothing and decoration are typical of late Anglo-Saxon art.